I'm a tiny bit childish about a lot of things, and my birthday is one of them. Honestly, if you can't celebrate yourself on your birthday, when can you? Also, I am blessed with a mid-May birthday in the northern hemisphere. This means that the weather usually has just turned from early spring ambiguity to late spring consistent sun, and the result is net joy. On the left is joyous me, wearing our Everything's Coming Up Roses vest and the Lauryn dress in rainclusters. On the right is the wild cherry tree in my mother's garden which JUST blossomed today as a remote birthday gift!! But what's joy unless it's shared? [Not very joyous at all, is the correct answer.] Therefore, for the next 7 days you get 40% off your full order when you enter BIRTHDAY at check-out (valid through May 21, 2018). You get to claim my birthday for a full week, and the best gift you could give me is loving Kær as much as I do! We will be adding a number of new products to the site this week too, starting with this Origami Bolero. 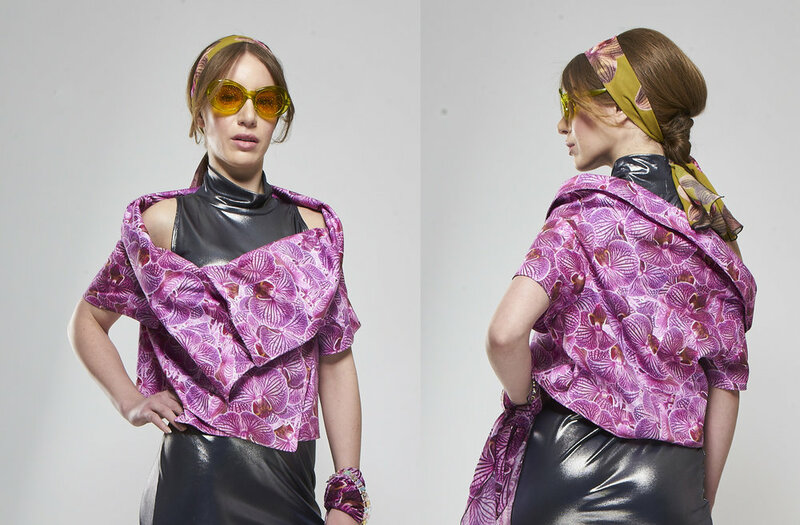 Ada is wearing our Origami Bolero in pink orchid print on 100% organic cotton sateen. Finally, and as a particular birthday celebration, we'll be designing new basic T's. Y'all have been telling me just how much you love and use our design t's, and so I'll be adding designs into the summer. A couple of samples are already on their way to Brooklyn from the printer in Cleveland (shhhh!) so you won't have to wait long. This is also me, celebrating mid-May 2017 in my mother's garden on Samsø, wearing the Bente gown. I don't know that I'd always style it with a wool sweater and a magnum Canard-Duchêne (assume, um, not), but Denmark can be sort of chilly and who says no to bubbly?! Don't judge.